While many of us Google I/O attendees were unsurprised by yesterday's announcement that Google was launching its own cloud-based music service, we were excited to learn that every one of us would be getting a priority invite to the service. As a big music nerd, I was excited to give it a test spin. Can Google do music? Read on to find out. Music Beta lets you upload your personal music collection to the cloud for streaming to your computer and other Android devices. Sound kind of familiar? You might recall that Amazon also rolled out a music player this year, Cloud Player. But unlike Amazon's service, Google's Music Beta does not sell music. So what's the appeal? It's simple and if you do everything through your Google account anyway, you might as well add music management to the mix. Furthermore, Android has always had a miserable music organization system so Music Beta is definitely a welcome addition to the platform. Your music and playlists are automatically kept in sync. So, if you create a new playlist on your phone, it's instantly available on your computer or tablet. The music files that exist on your phone or tablet will be mixed in with your cloud-based files. The idea is that you don't really have to think where their music is stored because it is all in one place. The service also lets you access your songs offline so when you're on an airplane or your Internet is down, you can still rock out. According to Google, Music is a free service-at least while it is in Beta. Take advantage of all that cloud storage while you can, I guess. The company gave no further details on pricing models or capacity limits. Right now, the beta allows for 20,000 tracks at any bitrate to be uploaded. Google could move to a tiered pricing model at various capacities and perhaps offer a free version that only allows for a handful of songs. Music Beta supports MP3, WMA, AAC and FLAC files. If you bought a bunch of DRM-protected music from iTunes, you're totally out of luck. Music Beta does not support M4P (Apple DRM) or M4A (Apple Lossless). You can access your library from any PC, but you can only stream from eight Android devices. Unless you have a ridiculous number of phones and tablets, that's a pretty generous limit. Setting up Music Beta is ridiculously simple. 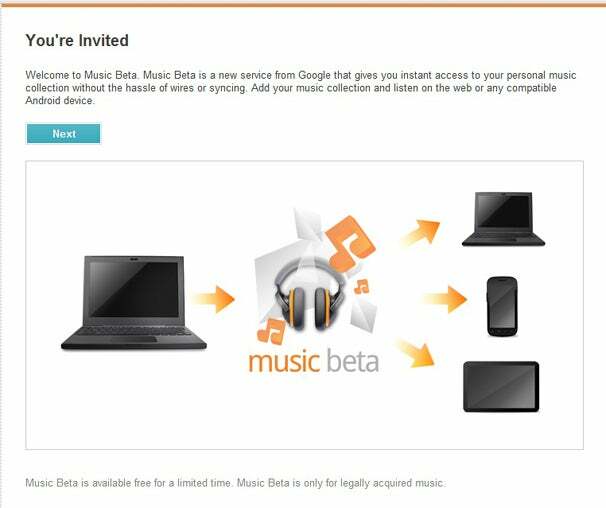 First, you'll need to request an invitation at music.google.com and sign in with your Google account. When that special day finally comes, you'll get an e-mail with a link to the service. After a gentle reminder that Music Beta should only be used for legally acquired music, you can get started. 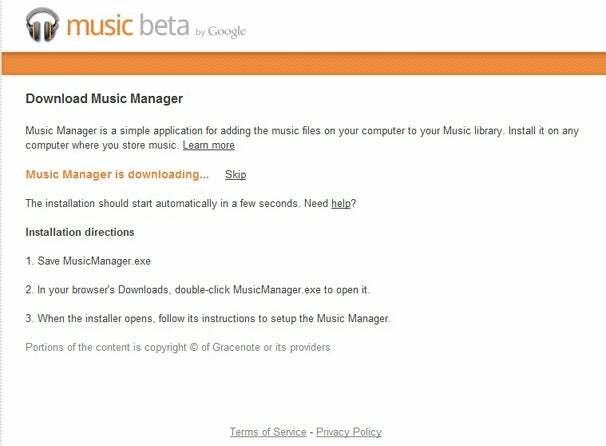 After a few user agreement menus, you'll have the "option" to download the music manager. Hm, isn't this a cloud player? Doesn't that mean I don't have to install additional software? Well, you do, or how else will you be able to upload your music? Luckily, Music Manager is fairly lightweight and definitely not as needy as iTunes. Still, it is a bit annoying to have to go through this step. Next, you'll sign in with your Google Account. Music Manager will then ask where you keep your music: iTunes, Windows Media Player, the Music folder, or somewhere else. You can opt in to add music automatically to Music Manager when you add them to iTunes as well. If you have a huge library, it will take quite a while to add all of your music. The nice thing is that you can listen to your music as it adds to the player. One important thing to note that if you're adding from a folder, it is all or nothing. You can't pick and choose which songs or albums from iTunes or wherever you want added to the cloud. If you have duplicates of albums or something you never listen to and don't want it taking up space, remove them from your library before you upload. Google also throws in a nice surprise by allowing you to download a couple of free songs as you set up your Music Beta account. You don't really have a choice over what songs you get, but you can choose from a couple of genres. I went with Metal. I found out later that "Metal," by Google's definition, is fairly broad so I ended up with a random mix of 80s hairband Warrant and doom metal band High On Fire. Okay, on second thought, you might want to pass on this.